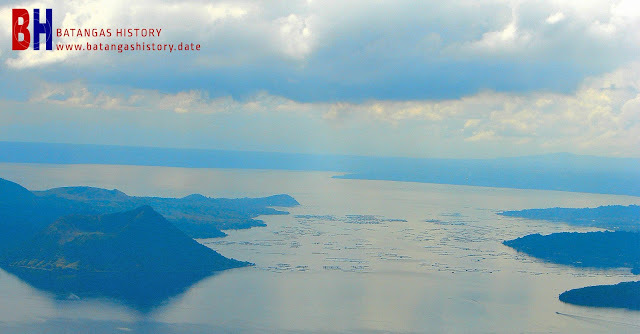 Taal Lake and the volcano crater island seen from Tagaytay. From the ethnographic collection of American anthropologist Henry Otley-Beyer, Taal Volcano, Taal Volcano eruption1, we extract this legend about the supposed origin of Taal Lake in the province of Batangas as it was told early during the American colonial era in the Philippines. The story was part of a paper submitted to Otley-Beyer in 1931 by one Porfirio D. Andal2 and filed under the category “Lipa, Batangas Province” in the collection. Regular readers of Batangas History will recall that the city of Lipa was originally a Spanish pueblo founded along the shores of Taal Lake. By 1931, when this paper was Andal’s paper was written, the then-town of Lipa still had an outlet to the lake through it’s then-barrio of Balete, which would not become a distinct municipality until 1969. The legend is provided verbatim below except for minor corrections for grammar to conform to the editorial standards of this web site. Annotations are provided in brackets [x[ where deemed necessary. A long, long time ago, Taal Lake was only a river flowing into Balayan Bay with its source from the northern part of the province of Batangas. Near the present site of the town of Lipa [at the time the paper was written, poblacion Lipa was already located in its present site], there lived a husband and wife who had only one daughter. During that time, there were yet very few people inhabiting the province. The couple was very religious and believed in one God named Bathala3. They were devoted and even prayed night and day. They believed in Bathala as the creator of all things. The daughter grew into a beautiful lady and suitors came to ask for her hand. Among the suitors, one was greatly in love with her as she was with him, but he was of a different faith from her parents. Her parents did not like her to marry one who professed a different religious belief. Because of her true love, she was able to persuade her parents (to give her permission) to marry the young man. The marriage was celebrated and afterwards the couple went to the home of the bridegroom which was located near the bank of the river. Many years passed by the couple did not have a child. There were already some signs of sterility. They forgot entirely their belief in God and cursed every living object they saw. One day, they decided to visit the bride’s mother in order to ask her why her daughter did not give birth do a child, now that it has been so many years since the marriage. When they reached her parents’ house, they found her very old and could hardly speak. They were received well and the woman’s mother was so anxious to see them. “We would be more appreciated if we had a son or a daughter,” said the wife. “What can we do? We have tried our best to have one,” replied her husband. They were made to eat on the table with the old woman. Everything was prepared for them. After the meal, the wife began to tell her experiences having an independent family. “What are those you like to know and ask of me?” replied the old woman. The old woman pondered the question and after a few seconds, she said, “Well, I will give you this advice. Go to a big cave near the source of the river near your home, at the foot of the big mountain, and you will see in the cave a gold cow. This cow is very powerful, and it will help you in any question of life. You should pray and adore the gold cow with all your heart. You should pray and adore the cow with all your heart. Be able to cast other beliefs and make it your true God. “How do we get there?” asked the husband. “Is this all we should do?” queried the wife. The couple was very happy and at once took a banca and began to row to the source of the river. The river was very swift and it took them two days to reach the cave. When they reached the cave, they prepared everything and the wife began to pray and with heart and soul tried to do everything her mother told her. When the man saw the gold cow, he was very much amused and instead of praying, he made fun of the cow and tickled it. He did not believe that the cow was powerful. Everything was performed by the wife, but the husband did not take heed of what she did. After the lapse of a long time, the prayer was put to an end and they decided to return. They took their banca and began to row for home. When they were halfway from home, a very strong storm accompanied by a tremendous earthquake occurred. The boat capsized and they were thrown into the river. The boat sank and the banks of the river cracked, stones fell into the river with a roaring sound. Suddenly, the water began to rise and spread over wider and wider areas so that it was impossible for them to escape death. The storm became stronger and stronger and finally the river was converted into a great body of water. When the storm abated, the water continued to cover large areas of land and it became very deep and blue like the waters of the sea. It was the belief among the old folks near the lake that the husband became the volcano at the center of the lake. As with other similar stories of the Otley-Beyer collection, the storytelling leaves a lot to be desired. However, there is some historical truth to it in that Taal Lake used to be, if not a river, then a channel connected to Balayan Bay wide enough to have been navigated by ocean-going vessels – i.e. galleons – during the Hispanic Era. Of course, the way the story ends is purely legendary. It was, in fact, the volcano that caused the channel to become a lake when volcanic debris from its eruption – which lasted for more than half a year – closed off the channel’s mouth and allowed water to accumulate over the years. 1 “Henry Otley Beyer,” Wikipedia. 2 distinct municipality “Mid noyths about Taal Lake, Batangas Province,” online at the Henry Otley-Beyer Collection of the National Library of the Philippines Digital Archives. 3 “Bathala” was already an “almighty” creator among Tagalogs in pre-Hispanic times, and for the Spanish missionaries, it was straightforward enough to equate this deity with the Christian God. Wikipedia.